Largo, MD — November 1, 2018 — CNN Political Commentator and Attorney Bakari Sellers will host the Council on Legal Education Opportunity, Inc.’s (CLEO) 50th Anniversary Awards Gala on November 15, 2018, at The Ritz Carlton Washington, DC. The event will feature the inaugural CLEO EDGE Heritage Award given to Presidential adviser, attorney, and businessman Vernon E. Jordan, Jr. for his more than 50 years of service to the legal profession and his outstanding commitment to Education, Diversity, and Greater Equality in the legal profession and society. The event’s theme is “The CLEO EDGE: 50 Years of Championing Education, Diversity, and Greater Equality in the Legal Profession.” The fete will also celebrate 50 individuals, law schools, and legal organizations in each of the three categories. Vernon E. Jordan, Jr., advisor to presidents, noted civil rights leader/activist, attorney, businessman, and a board member to several Fortune 500 companies has been named the inaugural recipient of the Council on Legal Education Opportunity, Inc.’s CLEO EDGE Heritage Award. 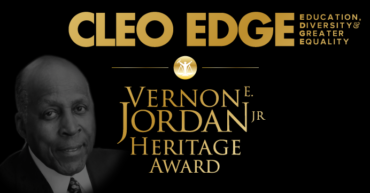 Hereafter, the award will be named the “CLEO EDGE Vernon E. Jordan, Jr. Heritage Award” to commemorate his lifetime achievements. The Award will honor a person who has demonstrated outstanding leadership in Education, Diversity, and Greater Equality in the legal profession and society. The Council on Legal Education Opportunity, Inc. (CLEO) announced that 25 persons have volunteered to serve on the Gala Committee for its 50th Anniversary to be held November 15, 2018, at The Ritz Carlton, Washington, DC. The Gala Committee plans and implements the major fundraiser that benefits CLEO’s programs. Phyllis P. Harris, Senior Vice President and General Counsel of Legal Operations at Walmart, Inc. and a CLEO alumna, is the chairperson. 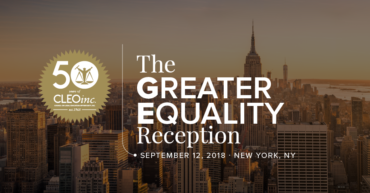 Individuals, law schools, and legal organizations that have made a significant impact on greater equality in legal education, the profession, and/or society will be recognized on Wednesday, September 12, 2018, at The New York Athletic Club, in New York City by the Council on Legal Education Opportunity, Inc. (CLEO). The Greater Equality Reception is the third reception of CLEO’s year-long 50th anniversary activities. 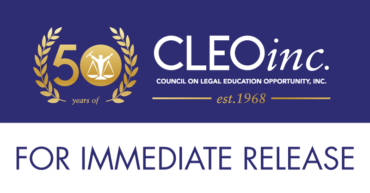 The Council on Legal Education Opportunity, Inc. (CLEO) has announced the New York City Host Committee for its Greater Equality Reception to be held September 12, 2018, at New York City Athletic Club, 180 Central Park South. New York City is the third celebration site of CLEO’s 50th Anniversary, which includes three receptions and a gala in Washington, D.C. The committee is composed of an array of local community and national leaders, law school deans, and partners in law. 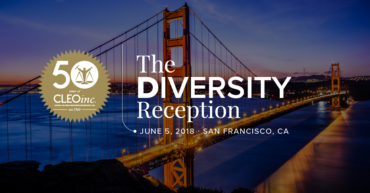 On Tuesday, June 5, 2018, the Council on Legal Education Opportunity, Inc. (CLEO) continues its year-long commemoration of its 50thAnniversary with a salute to individuals, law schools, and organizations that have had a significant impact on DIVERSITY in legal education, the profession, and/or society during the Diversity Reception at Google Downtown in San Francisco.